The device which at first glance seems to test their vision is in fact a sharp critic of the very act of looking at an artwork and the system they are embedded into, the incendiary spark inside the battle then propagating inside our consciousnesses in unexpected ways. 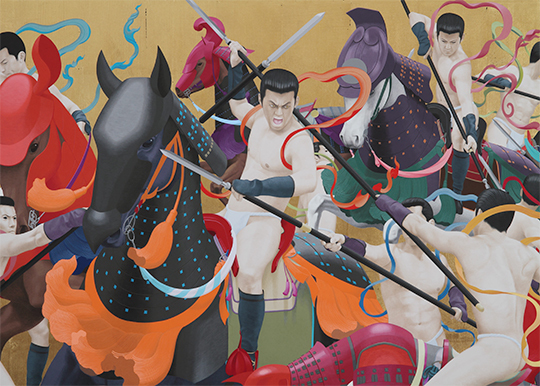 In 2000, Tenmyouya Hisashi defined himself as the champion of “Neo-Nihonga”, his unique style that revives traditional Japanese painting in the present, raising the flag of Butoh-Ha–or warrior style–to fight by painting against the all powerful authority of the fine art establishment. In 2010, he advocated the concept of “BASARA”–named after the word basara* used during the Nothern and Southern Courts period of Japanese history as well as the Warring States period’s kabukimono*–as a pompous and extravagant aesthetic current. More recently Tenmyouya even began producing his own commercial gallery as an upheaval against the art system, in the straight line of his constant rebellious activities. By violating the taboos on purpose, this exhibition comes as a true manifest for the pompous yet extraordinary spirit of BASARA. The show also includes the artist’s very first large installation work. Bearing the same title of Rhyme, it complements and completes the war picture, bearing the metaphysical vision that shakes the border of reality and fiction. This work bears the mark of the reality of our world after the Tohoku earthquake and the collapse of the myth of safety of nuclear power in Japan. Visitors may even feel the ominous footsteps that go on spoiling the actual world. This exhibition ought to be controversial at Tenmyouya’s satisfaction. How will you receive the intricately intertwined trap settle by him? And how will you read it? We look forward to your appreciation.